Safety – Purity Oilfield Services, LLC. All Rights Reserved. Purity Oilfield Services prides itself on putting “Safety First” at all times. We strongly believe that the most important aspect of the oilfield is making sure that all employees and other people associated with our operations and the community are working in a safe environment. Purity requires that all employees be trained and educated on various aspects of the oil and gas industry. We hold biweekly meetings and training sessions for the entire staff with employees who have obtained certifications pertaining to their field of work. Purity is ISNetworld, Petroleum Education Council (PEC), and OSHA compliant, meeting all our clients’ requirements to operate job sites. Additionally, to operate equipment on certain job sites, all our employees must pass our in-house certification. Purity offers safety consulting through in-house training for OSHA courses to all employees and other third-party vendors. Our team also provides safety consulting and supervision services to well sites. 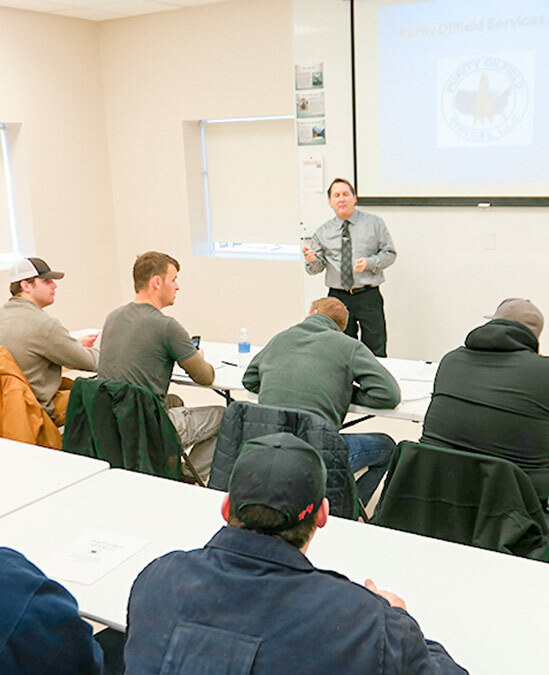 Let us help facilitate your employees’ progress through classroom lectures, hands-on training aids, and demonstrations at our training facility. Purity Oilfield Service’s safety processes are standardized using ISNETWORLD & PEC contractor management services.